To describe some of Ranga Narayanan’s research as out of this world would not be an exaggeration. Narayanan, a chemical engineer with expertise in fluid dynamics, works on research associated with outer space, where the low-gravity environment diminishes fluid flows. The flow patterns of fluids in outer space are markedly different from those under terrestrial conditions, and the implications on technology are profound. For example, fluid flow patterns change the conditions under which crystals are formed. Crystals, particularly from semiconductor materials, have a natural, three-dimensional order to their internal structure. However, defects in internal structure caused by fluid flow during their growth interfere with the use of the crystals, and factors such as gravity-related flow patterns contribute to these defects. During two space shuttle experiments, Narayanan and his team have studied the effects of microgravity on crystal pattern formation, and identified new mechanisms for convective flow in crystal growth. The research represented an important step in trying to improve crystal growth. In other research associated with space technology and fluid flow patterns, Narayanan and his student team have developed a device that can revitalize air in a closed environment. Such a device could help sustain human habitation in a Martian environment. But not all of Narayanan’s research is space-oriented. His most recent research projects in pattern formation have very terrestrial applications, from the improved design of heat exchangers to a better understanding of the drying-out process of artificial tears and eye drops and the evaporative drying of thin films. 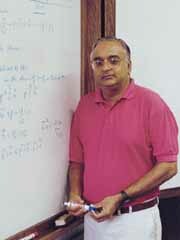 Narayanan’s work involves complicated mathematical formulas, which he loves to obtain, and simple experiments that help explain those formulas. Narayanan has garnered nearly $4 million in research funding during the last 10 years from sources such as NASA and the National Science Foundation.